Medical sources say dozens of people were killed in an attack on the rebel-held town of Douma on Saturday. The UN Security Council is expected to discuss the crisis on Monday. Both Syria and Russia deny a chemical attack took place and have reached an evacuation deal with the rebels. Outrage at the alleged use of chemical weapons has been widespread with Pope Francis saying, "Nothing, nothing can justify the use of such devices of extermination against defenceless people and populations." The European Union has called for an "immediate response by the international community". One video, recorded by rescue workers known as the White Helmets, shows a number of men, women and children lying lifeless inside a house, many with foam at their mouths. Other unverified footage shows young children crying as they are treated in a makeshift medical unit. However, it has not been possible to verify independently what actually happened, or the actual number of dead. The Union of Medical Care and Relief Organizations, which runs medical facilities in the Eastern Ghouta, told BBC News that 70 deaths had been confirmed. According to the US-based Syrian American Medical Society, at least 48 people died, showing "symptoms indicative of exposure to a chemical agent". More than 500 people were brought to medical centres with such symptoms, it said, quoting emergency services in Douma. 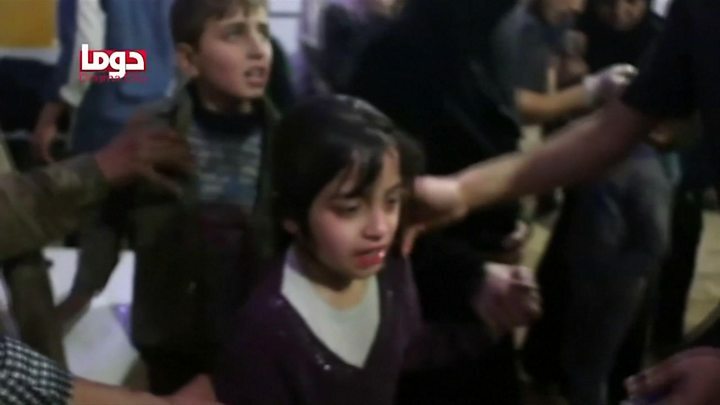 A doctor at an overwhelmed hospital in the rebel-controlled town told the BBC's Joel Gunter he had panicked as his own children coughed from gas seeping into the basement where they were hiding. A medical student described in horrifying detail how he had treated a dying man. The reported chemical weapons attack on the rebel-held enclave of Douma poses some hard questions. For the civilians, the families and children there, can they continue to bear the terror, bloodshed and inhumanity being rained upon them? For the militant rebel fighters, do they believe their struggle and continued resistance is still worth the price they and the civilians are being forced to pay by the Syrian government? For Russia, how far is it prepared to defend its allies' apparent use of chemical weapons when its own apparent use of a nerve agent in the UK is subject to so much global condemnation? And for the international community, how will it respond to what is clearly a test of its resolve one year on from the Khan Sheikhoun chemical attack? Will the ritual condemnations be backed by military action in an attempt to deter President Assad's further use of chemical weapons? Or will the West believe that any escalation would simply prolong a conflict that many just want to end? Could the US take military action? 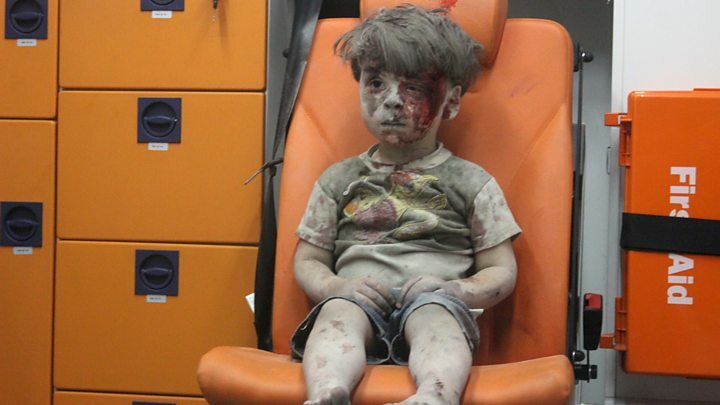 Taking to Twitter, Mr Trump described President Assad as an "animal". In April 2017, more than 80 people died in a Sarin attack on the opposition-held town of Khan Sheikhoun, and a joint inquiry by the UN and the Organization for the Prohibition of Chemical Weapons found the Syrian government responsible. In response, President Trump ordered a cruise missile attack on a Syrian air base. Asked if America might strike again after Saturday's reported attack, White House homeland security adviser Tom Bossert told ABC television: "I wouldn't take anything off the table." French President Emmanuel Macron has also threatened to strike Syria if the government uses chemical weapons against civilians. Before Mr Trump tweeted, the US state department said the attack, if confirmed, called for an "immediate response by the international community". UK Foreign Secretary Boris Johnson said on Sunday that the suspected chemical attack must be investigated urgently. "We are in close touch with our allies following these latest reports," he said. "Those responsible for the use of chemical weapons have lost all moral integrity and must be held to account." Syrian state media accused "terrorist" media of fabricating reports about a chemical attack in order to hinder the advance of government forces through the Eastern Ghouta. Russia's foreign ministry said reports of a chemical attack by Syrian forces on Douma had been "planted" in order to create a pretext for a possible military intervention in Syria. "The purpose of these mendacious conjectures, which are without any basis, is to shield the terrorists and the irreconcilable radical opposition, which rejects a political settlement, while at the same time trying to justify possible external use of force," it said. On Sunday, the Russian military reached a deal with the rebels controlling Douma, the Jaish al-Islam group, on a partial evacuation to end the fighting there. Buses have been seen entering the town to pick up rebels and their families. Russian military police will be admitted to the town while the rebels will be allowed either to leave or stay with a guarantee they will not be pursued by Syrian security forces, local negotiators told Reuters news agency. Syrian state media said earlier that a deal had been struck with Jaish al-Islam to allow them to leave Douma within 48 hours in return for them freeing prisoners. Douma is the last rebel bastion in the Eastern Ghouta region outside the capital, Damascus, following a government offensive. Russia launched its military operation in Syria in September 2015, saying it had been asked to intervene in the civil war by the Syrian government. In seven years, the war has left more than 400,000 people dead or missing presumed dead, while more than half the population have been driven from their homes.